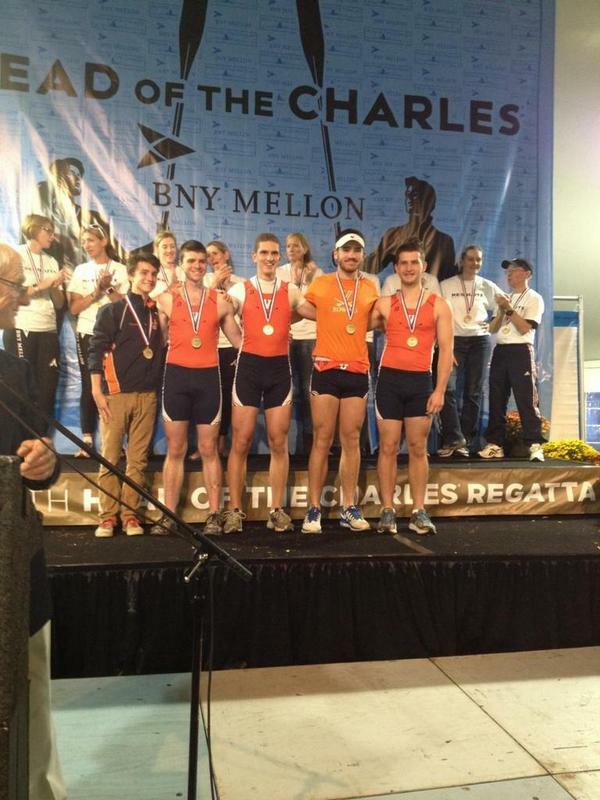 The following is an article written by alumnus Dan Schwartz ’14 recapping the successes at the 50th Head of the Charles. Thanks, Dan! I stood on the Belmont Hill dock on the Charles River in Boston in nervous anticipation. By all accounts, we were the favorites to take the gold in the Collegiate 4+ event, just like we had done for the past 3 years. But presumptions in rowing are your biggest enemy. With a total margin of victory of about 3 seconds over the always-threatening Michigan crew in the last two years, the possibility of a let-down was very real. Let’s rewind to the selection of these four rowers for this boat, over a year ago. 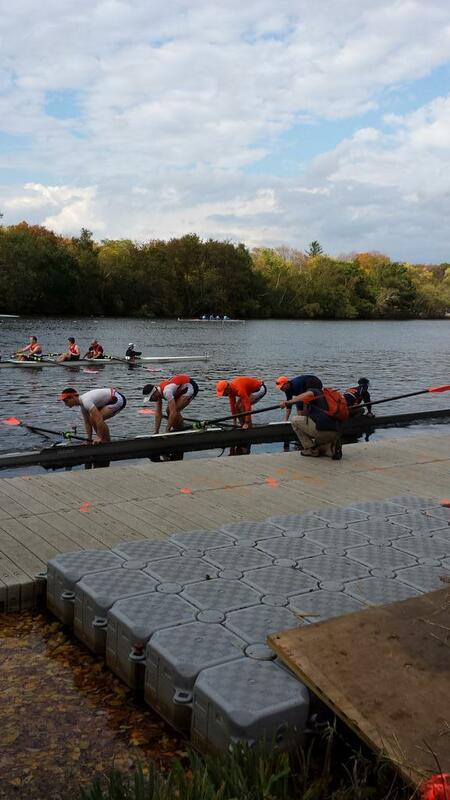 Virginia Rowing races two boats at the Head of the Charles – a Varsity 8+ and a Varsity 4+. The best 8 rowers are selected for the Varsity 8+, leaving the rest of the team to compete for the 4+. 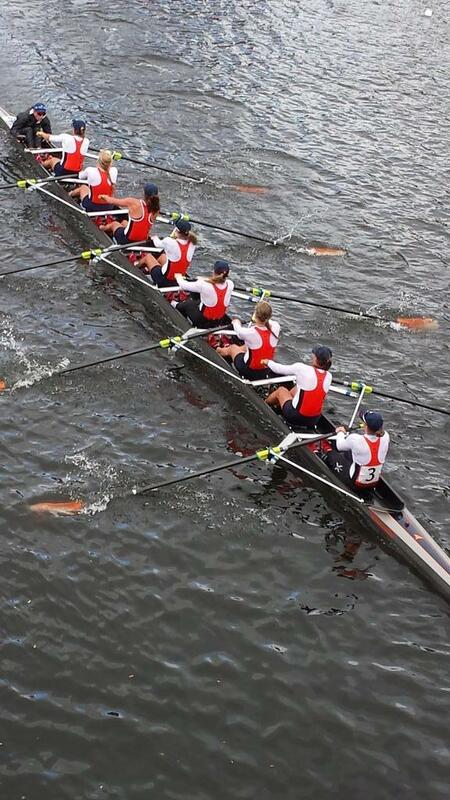 The lineup of the 8+ was finalized in mid-September 2013, but there just didn’t seem to be a fast combination for the 4+ as the Charles approached. Head coach Frank Biller made a rare move of bringing up two novice rowers, Nathan Heinzman and Keith Casscells-Hamby, to compete for the boat, possibly as a way of motivating the varsity members to step up their game. Whatever the reason, when these two 1st-years, with no collegiate racing experience, were placed into a shell with 2nd-year Andrew Heinzman and 3rd-year John McNulty, something just clicked. The boat suddenly leapt out of the water, and Coach Biller had his Charles Four. 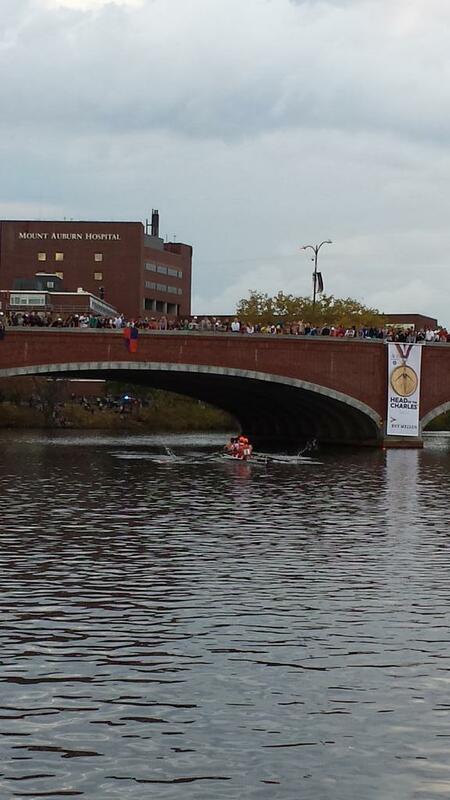 Heading into the Charles last year, expectations were nowhere near as high as they would be this weekend. A crew with that little experience seemed like a novelty among the commonly seen veteran crews that typically define the collegiate landscape. And yet, that Virginia crew would go on to beat out Purdue and Michigan in an absolute barnburner of a race, taking the Collegiate 4+ course record, at 16:26, along with it. Back in early September 2014, Frank Biller would make that returning crew an offer. They could stay together as a boat and try to repeat at the biggest regatta in the world, or look to compete individually to make the 8+. They chose to stay together in the 4+. With another year under their belts, the four rowers had even more effortless speed, and by all accounts were faster than ever. They were given a chance to prove it at the Western Invitational Regatta in Ontario, Canada. Prove it they did, winning their event with ease. Next would come the Charles. Pressure was high for the rowers and coxswain Jake Power. Not only were they expected to repeat their success from last year, but the possibility of taking four straight UVA titles in the Collegiate 4+ event loomed large in the program. Jake would have to follow in the footsteps of his coxswain predecessors – Valerie Roth, Sarah Zillioux, and of course yours truly. The target was on their backs, and they knew both club and varsity rowing teams would be lining up to take them down. 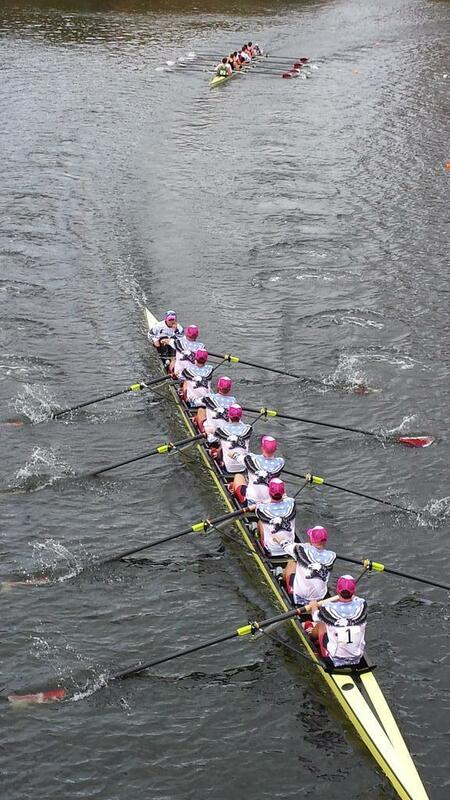 Head racing, rowing races in the fall, are much different than sprint races in the spring. Instead of an all out 6-minute straight-away, racing off the starting line 6 boats wide, fall races are against the clock, with each boat taking off in a line, about 5 seconds apart. The Head of the Charles is the granddaddy of them all, featuring 11,000 athletes racing in 2,132 boats across two days, all spectated by around 400,000 people. In races with up to 60 entries, there’s no telling who might sneak from the back of the pack and post a winning time. The Virginia Men, starting first, wouldn’t know their placement until they were safely back on land, when times would be posted. So I stood on the dock, right at around 2.5 miles into the 3-mile course. I could peer back through the Eliot Bridge, by far the most common place to watch the races, a far way back. I jumped around nervously, waiting to see those day-glo orange blades appear around the long Eliot turn. Based on their margins over Michigan and the other boats, a safe guess could be made about where they stood in the race. Finally, they rounded the corner. They looked good. Really good. Jake Power took a perfect line coming through the bridge to the cheers of tens of thousands of spectators. And there was naught another crew behind them for what seemed like an eternity. The Michigan boat would take 30 seconds to finally appear around the turn. I start screaming like a lunatic. The few other people standing on the dock, part of a private party that myself and the UVA coaches were most certainly not invited to, looked at me with confusion. I didn’t care, because I’m chanting “U-V-A!!! !” in the rowers’ faces as they come right up against the dock on their way around the final turn. Each stroke was a punch in the mouth. Four oars perfectly in sync. We knew we had won. As I sprint the mile from that dock to the boat trailer, pushing through the gridlocked crowd and Brooks Brothers tents, I refresh my phone to confirm the results. Finally they appear. 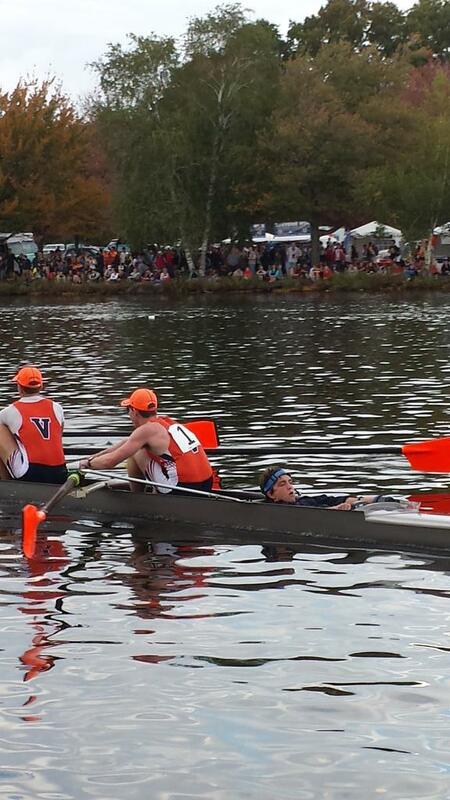 Not only did that UVA Collegiate 4+ repeat, they did so by 20 seconds. Not only did they break their own course record, set last year in perfect conditions, they basically burned it down. They were a full 10 seconds faster than last year, even with a headwind for the entire course. Even more impressive, they did it without a single boat around them, giving them no direct competition to push them during the 16-minute, 16-second stretch of physical hell. I nearly tackled them when I caught them at the trailer to tell them the news, since of course they still didn’t even know if they had won or not. Teammates and coaches gradually arrived to join the celebration, turning the trailer area into a chaos of excitement and hugs. With VRA president John McNulty graduating in May, and the rest of the season spent racing in 8s, that boat will most likely not race again. But those four men will always have two of the most valued possessions a rower could ever attain, the Charles gold medal. The Virginia Rowing Association will always keep this story in its lore. And on the other hand, the elite Princeton Chase is a week away, with the Head of the Hooch, an opportunity for the Varsity 8+ to get another crack at Michigan, just a week following that. Time to get back to work. -According to RowingRelated, the Virginia men and women combined for the 3rd best combined Alumni showing overall – with the women taking 2nd and the men taking 6th. The men’s alumni have improved their placement every year for the past 5 or 6 years, and are now officially knocking on the door of the elite alumni crews. -Virginia Rowing alumnus Matt Miller raced in the US National 8+ that finished 4th in the Championship event, behind two proverbial All-Star boats (known as the “Great 8s”) composed of the best rowers in the world, as well as a surprising Harvard crew. 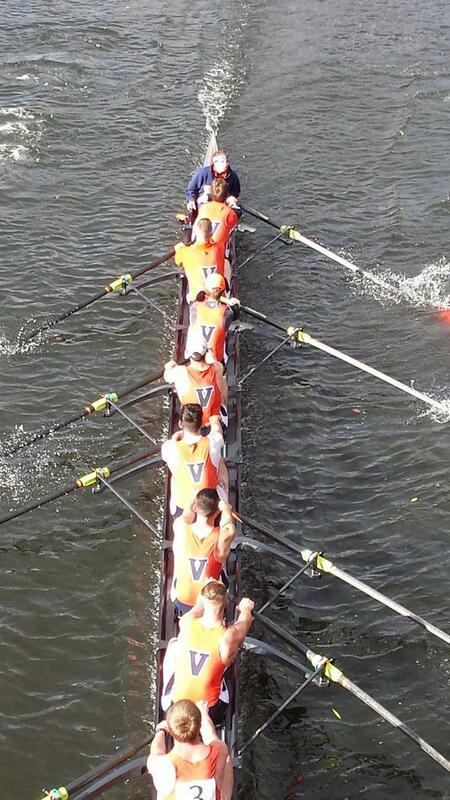 -The UVA Women once again had a phenomenal showing at the Charles. Their Varsity 8+ finished 3rd overall in the Championship event. This seems just okay, until you consider that they only lost to the Women’s Great 8+ and the defending Olympic gold-winning US National 8+. This was their FOURTH consecutive collegiate title. The Championship 4+ would finish 2nd among college crews. -The Men’s Collegiate 8+ would finish in 4th, the 5th consecutive top 5 finish.